If there were a hospice for newspapers, a compassionate newspaper doctor might be suggesting to the loved ones that the vital signs are faltering, there are other early signs of systemic shut-down, and it might be time to make the patient comfortable and start saying goodbye. The Internet CPM business model was never going to compare with rate card advertising. 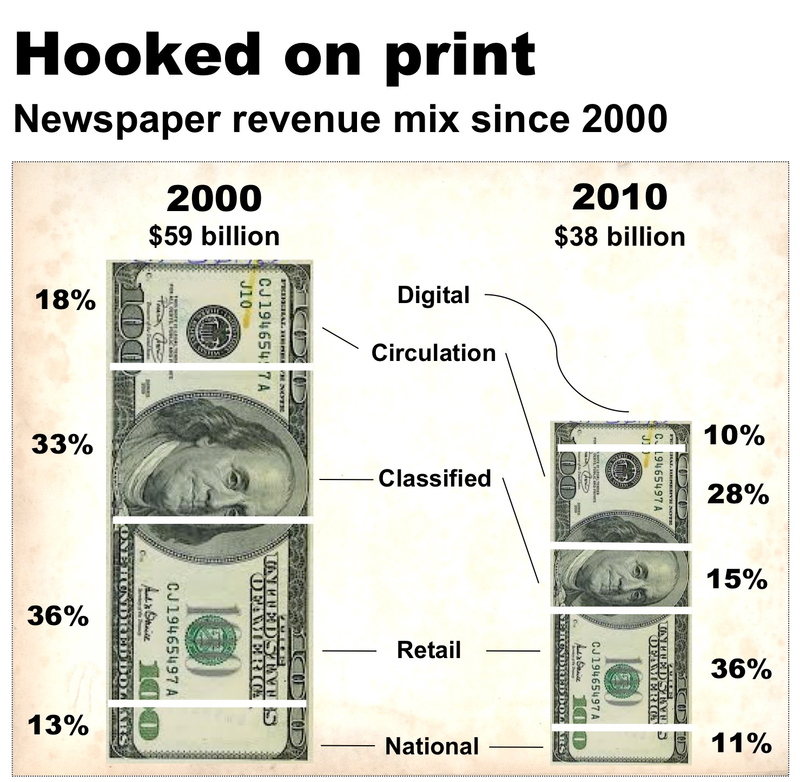 Digital dimes for print dollars. The problem isn't the present as much as the future. Younger people don't read in print very much, particularly newspapers. People are willing to tolerate display ads in newspapers and magazines because they don't distract from the experience, but popups and banner ads and other forms of Internet advertising are just plain annoying, and no one reads them. I'd suggest that if people continue to adopt the iPad and other tablets that the tablet format might be more valuable to publishers and advertisers than the Internet ever was. But if newspaper publishers don't control the process, they could get sucked into the same CPM sinkhole. I agree totally with Joanna Leiserson has said. Life support lasts only so long, Hospice now seems the humane thing to do. Any way you slice it, when you slash and slash staff and can't provide local news and information it's time to turn out the lights. From an advertising standpoint, the 35+ years I've spent dealing with newspaper reps has been anything but a true partnership. We advertisers partly created that monster by just continuing to fax insertion orders and never asking nor receiving any true marketing data that might help clients. here we are in 2011 and all I receive are "fire sale" e-mails telling me that color is now half off, or that material closing is a day earlier due to the holiday...Very creative, huh? Why would a newspaper stop printing a paper when ink on paper is such a powerful, effective advertising medium for local businesses? You don't see car companies encouraging their customers to take the bus. The slow economy certainly hurts, but community newspapers all across the country are doing pretty well. And with their websites, they can offer everything a web-only publication can -- and a newspaper! In that infographic, the artist reduced both the width and the height of the bill, making it look like the total decrease (by area) is bigger than it really is. As this is a very long running conversation it's important to have the summary facts spelled out in such a clear and concise way. Much appreciated. As I've said before, watching the future of publishing play out is the most exciting cliff-hanger since "Where Eagles Dare"!